Hire a Rodeo Bull, known by some as a Bucking Bronco or Mechanical Bull, and provide as much amusement for the spectators as it will for the rider as he or she tries to stay on the bucking, spinning bull as long as they can. 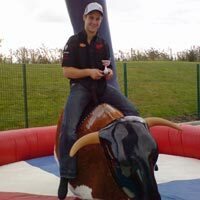 The Bucking Bronco makes it an ideal entertainment for parties, receptions, promotions, fun days and of course any event with a theme and need for Wild West Games. 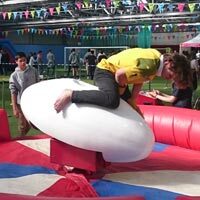 Our Bucking Bronco is always supplied with an experienced ride operator who will run the ride safely on your behalf for the duration of the hire. The speed of the Bucking Bronco is controlled at the discretion of the ride operator so it is suitable for both kids and adults. Because we operate most modern design machine we don't have a minimum rider age like older machines but instead have a minimum rider height of 1.2m - for riders under this height please have a look at our Junior Rodeo Bull ride. Irrespective of age or size riders must be able to climb on to the Rodeo Bull without assistance. The Bucking Bronco is fully computerised and features a large digital timer display so the length of each ride is automatically there for all to see. The Bull can be either manually controlled with an eight way joy stick control or can be switched to an automatic 'Competition Mode' where each rider will receive an identical ride so you can hold your own Rodeo competition. We provide a free trophy to present as a prize for the person who rides the Rodeo Bull the longest. 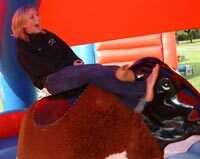 The Rodeo Bull can be hired for use indoors or outdoors (no charge for bookings cancelled due to poor weather). A FREE inflatable marquee is provided to cover the bucking bronco for all outdoor bookings as is all weather flood lighting. Also included with every Rodeo Bull hire is Steerhead Lassoing with a genuine lariot lasso, and we also supply a trophy for the person who rides the Rodeo Bull the longest. The inflatable mattress requires an area of 17ft x 17ft. If indoors a roof clearance of 9ft is needed. If using the inflatable marquee a space of 23x23ft is needed. Our Rodeo Bull is the latest design and having a more compact base unit it will fit through narrower doors and passageways than the larger old design bulls. All door or passageways it has to fit through need to be just 33inches wide. Unlike some of the older designed Bucking Broncos it is also far more efficient on the electrical power it draws so avoids the problem of surging which can cause the 'tripping' of fuseboxes - this can be a common problem with some Rodeo Bull makes. A single 13amp, 240volt mains electric supply is required. However, if you have no electric supply available at your venue then we may be able to provide a petrol generator at additional cost. Please contact us for details. Our Rodeo Bull is safety tested by the manufacturer annually and has a test certificate to confirm this - not all of our competitors have this! All our electrical equipment is PAT (Portable Appliance Test) certified which is required by some venues. The documentation for this, together with Risk Assessments, and a copy of our Liability Insurance Schedule are available for inspection if required. 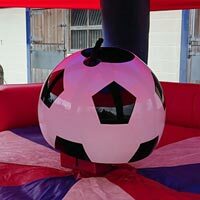 The usual length for Bucking Bronco hire is 3 or 4 hours but this is flexible. Just let us know your requirements and we will tailor the Rodeo Bull hire period to your requirements. 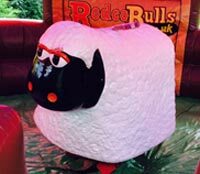 If you are looking to hire non-Wild West inflatable games, side stall games, and other attractions in addition to the Bucking Bronco or our other Wild West Party games we will allow a discount on the hire of additional amusements. If you have to cancel any booking for any reason other than poor weather the following terms apply: More than 28 days notice then you will lose only the deposit paid. 14-28 days notice then a cancellation fee equal to 50% of the total hire fee will be due. Less than 14 days notice then the full charge is payable unless paid within 5 days of cancellation when it will be reduced to 75%. Cancellation fees will be pursued as necessary including legal action if so required. 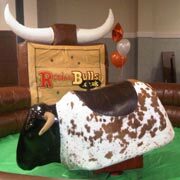 If you have any queries, questions, or would like to book a Rodeo Bull and Bucking Bronco for your party or event please contact us and we will do all we can to help.